Climbing roses are ideal for growing against a wall of a house and often produce large shapely flowers. Unlike many ramblers, most climbers will also repeat flower, providing colour throughout the summer months. Smaller climbers can also be grown in pots making them great for patios and smaller gardens. We recommend planting Clematis alongside Climbing Roses to extend the flowering period. Also, by choosing colours that complement each other an otherwise dull and lifeless area can be transformed into an eye-catching focal point. 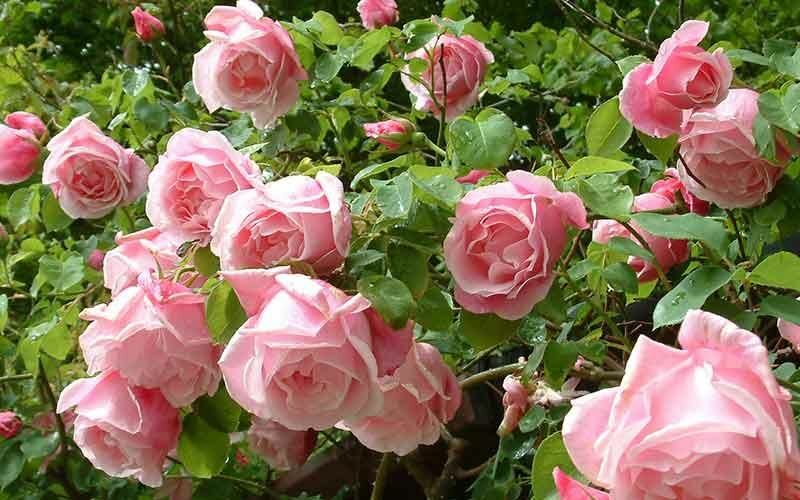 This magnificent climbing rose produces an abundance of intensely perfumed deep pink fully double blooms, complemented with lush dark green foliage. Ideal for growing over an arch or doorway trained along a fence. Bred by Delbard. (Bourbon Climber) A favourite of mine. Large, flattish blooms of pale pink. With deeper centres. Fragrant. Very double and free flowering. (Noisette) 18th Century. One of the first Noisettes. An attractive blush pink rose of gentle growth. Can be grown as a superb shrub or as a small climber. Fragrant. Long flowering period. (Modern Climber) Apricot, hybrid tea-like flowers, produced freely amongst dark green foliage. Unique to us in the UK. (Modern Climber) Fully double blooms of cerise pink and cream in clusters. A strong growing climbing rose of merit.